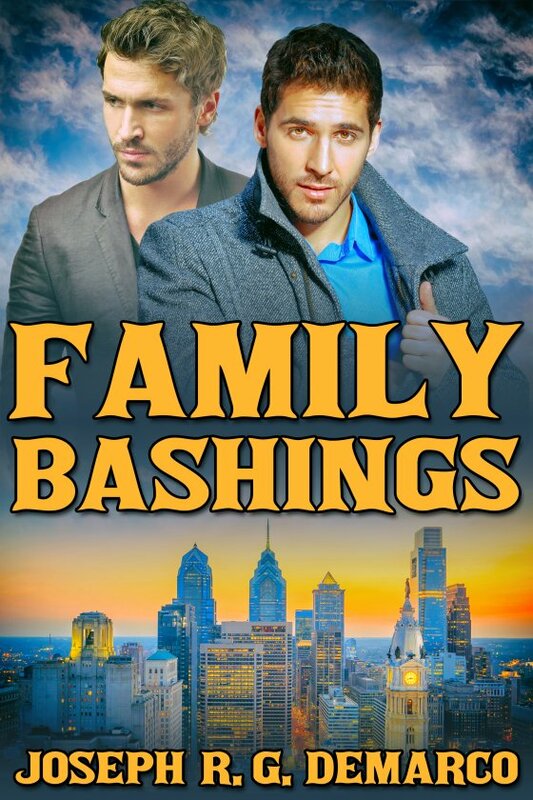 Family Bashings by Joseph R.G. DeMarco is now available! Disgraced cop Doyle McCann and former undercover cop Kord Verlangen are forced to partner on a cold case which they must solve or lose their jobs. Doyle is gay and out; Kord says he’s straight. Both harbor secrets they never want revealed. The case, involving a series of gay bashings two years earlier, takes them through the underbelly of Philadelphia’s gay nightlife, and Doyle has reason to believe the Mafia may also be involved. Following years’ old leads is hard enough. But working together proves even more difficult as the sexual tension between Doyle and Kord rises and begins to overwhelm their focus. As they come closer to solving the case, their team is split down the middle, threatening to destroy any chance for them to keep their jobs. What will it take to get them working again and keep them on track? “You think so, do you?” Kord’s voice sounded more carefree — deep, like a sensuous wind chime, still able to curl its way around Doyle’s spine and make him shiver — but lighter somehow. Maybe it was because there wasn’t any anger in it. “Not sure I’d be shocked at most anything these days.” Doyle felt old. It wasn’t so much his twenty-eight years, or his seven years as a cop and detective. It was everything he’d seen: the people, the cruelty, the casual violence. “That so?” Kord fidgeted in his seat, getting comfortable. As he did, his knee touched Doyle’s and didn’t move. Consciously or not, Kord kept his knee right where it was. Doyle caught himself before he reacted and kept his eyes on his menu. The booth was small and both of them were taller than average. Kord, even taller, had long, muscular legs. There wasn’t anywhere else they could go under the table. Doyle looked up from his menu and caught Kord staring at him. Kord’s cool green eyes mesmerized Doyle whose mind went into overdrive. Kord slipping into his bed. The two of them tangled beneath the sheets, their sweaty bodies sliding against one another. Labored breathing as each wrestled with the other to get closer, more intimate. “Somethin’ wrong?” Kord asked, his voice gruff. “Just coffee,” Doyle said, still a little dazed by his fantasy. Kord’s knee continued to press against his and he dared not move away. Whatever test Kord was conducting, Doyle intended to pass. That knee, though. It was like fire against Doyle’s leg. It felt as if it would burn through his clothes and on into his flesh. At the same time, it felt good. He’d wanted to touch Kord the first moment he saw the blond hunk. If this was as close as they’d ever get, he wanted to enjoy it. “A big piece of that lemon meringue pie and some coffee.” Kord sounded like a little kid. Doyle tried looking at him surreptitiously but that was impossible. And he hadn’t yet moved his knee. It still pressed firmly against Doyle’s.